Rush Enterprises Inc. rode an expanding commercial vehicle market and aftermarket business to higher net income and earnings in the 2017 fourth-quarter and full-year periods. Net income in the quarter for the period ended Dec. 31 was $106 million, or $2.54 per diluted share, on revenue of $1.2 billion. In the 2016 period, earnings were $12.5 million, or 31 cents, on revenue of $1 million. As a result of recent tax reform legislation, the company’s annual and fourth-quarter tax expense decreased by $82.9 million, according to the San Antonio-based company. This was primarily due to the revaluation of the company’s deferred tax liabilities at the new corporate federal income tax rate of 21%. Excluding these two events, the company’s annual and fourth-quarter diluted earnings per share would have been $2.28 and 66 cents, respectively. For the full year, Rush — the nation’s only publicly traded truck dealership with about 100 dealerships in 20 states — earned net income of $172 million, or $4.20, on revenue of $4.7 billion. A year earlier, net income was $40.6 million, or $1, on revenue of $4.2 billion. “I think in 2018, there is going to be a lot more over-the-road growth than there was last year. Everybody’s rates have gone up quite nicely,” Chairman and CEO W.M. “Rusty” Rush told analysts during an earnings conference call in February. At the same time, he expects the vocational business to remain strong, but it probably won’t have as much of a pickup as the over-the-road business. Vocational had a big pickup in 2017, which was why Rush increased its market share of sales of Class 8 trucks, he added. However, aftermarket business is the key piece of his organization — including mobile repair, technicians embedded at customers’ shops, more inventory that includes all-makes of parts and more sales people, he said. Aftermarket revenues from parts and services in the fourth quarter were up 16% over the fourth quarter of 2016, and the company’s absorption ratio in the fourth quarter of 2017 was 128%, a record high. Aftermarket products and services revenues were $1.5 billion for the full year, compared with $1.3 billion in the 2016 period. The company calculates absorption ratio by dividing the gross profit from the parts, service and body shop departments by the overhead expenses of all of a dealership’s departments, except for the selling expenses of the new and used commercial vehicle departments and carrying costs of new and used commercial vehicle inventory. In 2017, Rush Class 8 retail sales accounted for 6.6% of the total U.S. Class 8 market, compared to 5.5% in 2016. The company sold 13,083 Class 8 trucks in 2017, an increase of 21% compared with 2016. 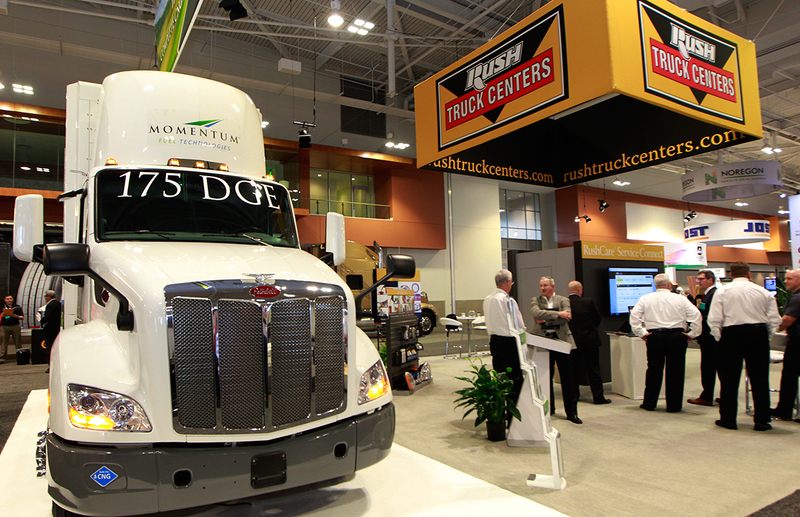 Rush is a dealer for Paccar Inc. and Navistar International Corp.
Paccar’s brands include Kenworth Truck Co. and Peterbilt Motors Co.
Navistar is the parent of International Truck. Rush also sells trucks by Mitsubishi Fuso Truck of America Inc., a unit of Daimler AG; Ford Motor Co.; Hino Trucks, a brand of the Toyota Group; and Isuzu Commercial Truck of America Inc. The company delivered 10,952 new medium-duty commercial vehicles, 1,661 new light-duty commercial vehicles and 7,060 used commercial vehicles during 2017, compared with 10,816 new heavy-duty trucks, 11,135 new medium-duty commercial vehicles, 1,676 new light-duty commercial vehicles and 7,008 used commercial vehicles during 2016. Rush told analysts he continues to expect annual company revenue will more than double and reach $7 billion by 2022, but declined to elaborate on the exact means of reaching that goal.